Advanced Cetyl M for Dogs Review: Is This A Scam Or Legit? Advanced Cetyl M® Joint Action Formula for Dogs is marketed as a 5-way joint action formula for active dogs. It is meant to relieve the symptoms of ailing joints by attacking the root causes of joint complications. The producers say it achieves this by regulating the immune system’s response to both external and internal stress. The manufacturer claims that this is the only product in the market that helps rebuild and stops the degeneration of joints. Is it true? Read the entire review to find out. Advanced Cetyl M® Joint Action Formula for Dogs is sold in a white bottle with a white label with green font. Each bottle contains either 360 or 120 easy to chew tablets that can be easily mixed with meals or taken directly from the palm. The product is available over the counter for roughly $18-$37. This price may vary depending on the store you buy it from. Be sure to confirm shipping and handling costs before buying. What you should know about Advanced Cetyl M® Joint Action Formula for Dogs? This product is made from natural ingredients that have been proven safe for your dog. However, the safety is guaranteed only if you follow the administration dosage carefully. 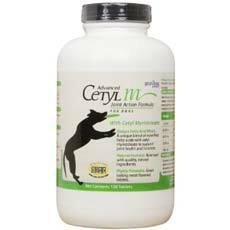 What are the ingredients of Advanced Cetyl M® Joint Action Formula for Dogs? Garlic Root – Garlic is a herb used mainly as a flavouring in food. However, it has been used traditionally to prevent and treat a wide range of conditions and diseases. Bromelain – found in small quantity. It is popular in the joint care arena due to its natural anti-inflammation properties. Natural Roast Beef and Liver flavourings – makes it dog friendly. 1. Initial Loading Period: when you first start using this product use an initial dosage of 2 tablets per 25lbs. weight daily for the first 4-6 weeks or until you get the intended results. You may opt to divide the dosage into two; evening and morning. The manufacturer recommends that you administer the recommended dosage approximately the same time of the day daily. For better absorption, administer tablets on an empty stomach. You may feel free to adjust your dosage level as you deem necessary. Advanced Cetyl M® Joint Action Formula for Dogs packs some of the ingredients we have been accustomed to in joint care. Perhaps the only ingredients missing in action are glucosamine and chondroitin but we feel that they are adequately compensated for. In fact, they absence is a blessing in disguise since Advanced Cetyl M® Joint Action Formula for Dogs can be used on animals that are allergic to fish. We like the response this product is getting from the market. It has a rating of above 75% satisfaction which is something major. We highly recommend this product.